For Christmas, my friend Christine bought Luke the Mo Williams’ book, I Will Surprise my Friend. This book has quickly made it into our nightly reading routine, and Luke loves it more than almost any other book. 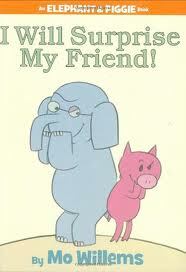 The plot is pretty simple: Gerald, the elephant, and Piggy, the pig, decide to surprise/scare each other as they hide behind a big rock. But when they both look for each other and can’t see the other, Gerald gets really worried, imaging all the terrible things that could have happened to Piggy. Piggy, however, gets hungry and decides it’s time for lunch. When they both emerge from the rock, they successfully scare each other. Seriously, Luke loves this book so much that he can practically tell the entire story himself. But today, after his nap, he decided he wanted to act out the book. For almost two hours, Luke and I played a game that goes like this: Luke tells me to turn around so my back is toward him. Then he says “boo” and scares me. I turn around and feign surprise and say, “you scared me!” Then we switch roles, and I scare Luke. We then scared Baily, Milo, and Maddie after we picked her up from school. Each time we did this, Luke laughed hysterically. I had some work to finish this afternoon, but I’m glad I saved it for later because watching Luke laugh so hard at such a silly, simple game was worth every minute. I’m thankful we had such a good time, but more importantly, watching Luke crack up over such a simplistic game made me realize how often I forget to notice the small and funny things in life and how often I forget to enjoy these moments and slow down. Sometime looking at life through the eyes of a two-year old are the best moments of my life. -are you ready to play outside? Me, too! I love Gerald and Piggy, too!